About News History Maps Numbers Reports Science Seminars Teaching WSI Assoc. And so to facts and figures ... the statistical evolution of any organization such as the Walter Schottky Institut not only charts its development, growth and achievements, but also illustrates how human and academic factors have combined to promote the successes that we have enjoyed over the past twenty years. Rather than merely providing lists and tables detailing numbers of staff and students, research funding, publications, awards and prizes we have chosen instead to present a historical profile of the WSI in numbers. Immediately following its inauguration in May 1988, the WSI had a total working area of about 2400m² that was subdivided into laboratories, workshops, offices and administrative space. Three new full professorships were created by the Bavarian ministry of sciences, culture and arts; one seeded in the Faculty of Electrical Engineering and two that were incorporated into the Physics Department of the TUM. As is the case today, this strategy ensures that research topics in the WSI address both fundamental questions in semiconductor and nanostructure physics and allows novel ideas to be pursued to the point where new types of devices are realised and optimised. The number of researchers at the Walter Schottky Institut has grown continuously. Today, the WSI and ZNN accommodates the research groups headed by Markus-Christian Amann, Martin Brandt, Jonathan Finley, Michael Kaniber, Kai Müller, Gregor Koblmueller, Alexander Holleitner, Friedemann Reinhard, Martin Stutzmann, and Ursula Wurstbauer with a total headcount of about 150, including junior research group leaders, scientific and technical staff, postdocs and visiting researchers, secretaries, and doctorate as well as master and bachelor students. Out of these, about 30 positions are funded by TUM, while basically all the doctoral student positions are financed via research projects with external funding. From the earliest days of operation, the relatively small core of permanent members of staff was augmented by the “lifeblood” of all successful research institutes – students. Over 500 master and diploma students have graduated from the WSI until now. In the same period, >200 doctorate candidates have finished their theses. To the best of our knowledge, all of the students were able to find appropriate jobs in a very short time after finishing their work at the WSI. About 70% of the PhD graduates are now working for high-tech industry. Twenty percent remained in academia and one third of those are now professors at other universities or directors of research institutes. 10% went into other areas like intellectual property management or consulting. 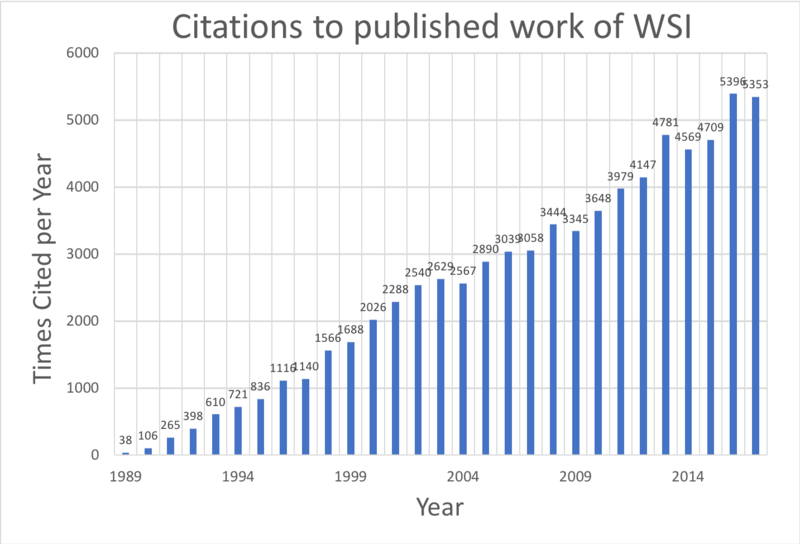 The total number of Master, Diploma and PhD theses completed in the WSI has risen steadily from less than twenty per year in the early 1990’s to well over fifty in the last few years. Since 1997, most of the completed PhD theses have been published as a series of books that have served to make them more accessible to other scientists. This series currently numbers >200 volumes and addresses a wide spectrum of topics from semiconductor nanoscience. Publication of PhD theses is one of the many activities supported by the WSI Alumni’s Association (Verein zur Förderung des Walter Schottky Instituts der Technischen Universität München e.V.) that was founded in 1997 to maintain contact with past, present and future alumni, guests and colleagues, and also to provide a forum for public relations and general activities. Over the last twenty years the Walter Schottky Institut has earned its reputation as being one of the top institutes worldwide for the production and characterisation of ultra-high quality semiconductor heterostructures and for cutting edge research in semiconductor nanoscience. Something like 75% of the total annual budget of our institute (~4-5M€) comes from external research contracts financed by a wide variety of sources including the German Research Foundation (DFG), the German Ministry of Education and Research (BMBF), the State of Bavaria and the European Union. In addition, almost a quarter of our research income since 2004 has been drawn from a range of cutting edge projects conducted in close collaboration with industrial partners such as Degussa AG, Fujitsu Laboratories of Europe, Siemens, OSRAM and BMW, to name only a few. Most recently, a number of members of our institute have been successful to attract ERC Starting and Consolidator grants – one of the gold standard labels of excellence for fundamental research. As mentioned above, several groups within the WSI are actively participating in the Nanosystems Initiative Munich (NIM), one of the first five Clusters of Excellence in Natural Sciences that were initially selected for funding by the German government Excellence Initiative in late 2006. Within NIM, scientists from various research facilities in the Munich area in the fields of physics, biophysics, physical chemistry, biochemistry, pharmaceuticals, biology, electronics and medicine work closely together with the overall goal to design, produce and control a series of artificial and multifunctional nanosystems. After a highly successful first funding period, NIM was extended in 2012 for a further six years until the end of 2018. For more information see the NIM website. The Walter Schottky Institute currently has eight principle investigators who actively participate in NIM in research areas I (Quantum Nanophysics), II (Hybrid Nanosystems) and III (Energy Nanosystems). NIM also provides vital supporting infrastructure for several large pieces of shared nanofabrication equipment including Focussed Ion-Beam (FIB) and electron beam (e-beam) nanofabrication systems and partially supports the running of shared facilities. In order to address an urgent need for improvements to the fundamental nanofabrication infrastructure of the WSI and to accommodate the ever-growing number of independent junior research groups, funding for a ~14 M€ extension to the WSI was granted by the German government in late 2007. The WSI-Center for Nanotechnology and Nanomaterials (WSI-ZNN), opened in 2010 and is now fully functional. WSI-ZNN provides a total working area of 2000m2 divided into laboratories, office space and seminar rooms and provides a 600m2 state of the art nano-fabrication shared facility that will house special lithography (FIB, e-beam) and nano-analytical tools that are needed across a wide spectrum of nanoscience research. About half of the laboratory space in WSI-ZNN devoted to special research laboratories of new research groups supported by NIM, the Technische Universität München and a wide range of other funding sources. The expertise that has been built up in the WSI for the growth and fabrication of semiconductor materials and their associated nanostructures naturally kindled a very large number of national and international collaborations over the past thirty years. These interactions have involved the growth of ultrapure semiconductor materials, including Si, Ge, Arsenides, Antimonides, Nitrides, Phosphides, Oxides, Ferromagnetic Semiconductors and the fabrication of low-dimensional nanostructures. The WSI has enjoyed many mutually beneficial exchanges of staff, students and knowhow with other research groups in both universities and industry, stemming from the four corners of the world. For example, over the past thirty years the WSI has collaborated with many groups throughout Germany and published more than one thousand papers together. Many hundreds of other papers have been written in collaboration with colleagues worldwide, spanning over forty different countries. The geographical distribution of WSI collaboration partners is illustrated by the maps of collaboration vectors that indicate the numbers of publications. By making such global links, scientists in the WSI have benefitted greatly from the free and open exchange of information that makes semiconductor nanoscience such a vibrant and rapidly moving field of research. One of the objectives of any semiconductor research institute is to make the step from good scientific ideas and develop them into innovative products. Over the last years numerous patents were successfully applied for and five spin-off companies were founded by Walter Schottky Institut researchers. Dr. Karl Eberl founded the company MBE Komponenten GmbH in 1989 after completing his PhD thesis in the Walter Schottky Institut under the supervision of Gerhard Abstreiter. Dr. Eberl has a special place in our history as he was the very first PhD student to graduate from the WSI, researching the growth of SiGe-based semiconductor heterostructures. He then spotted an opening for the marketing of systems and components needed in the semiconductor industry for the fabrication of epitaxy components. First products were Silicon Sublimation Sources, Carbon Sublimation Sources and High Temperature Sources for Molecular Beam Epitaxy and the company is going from strength to strength almost twenty years after its foundation. VERTILAS GmbH, with its headquarters nearby the WSI in Garching, was founded in December 2001 by associates of the Semiconductor Technology Group at the Walter Schottky Institut. The company develops, produces and distributes innovative laser diodes for optical communications technology, sensor engineering and measurement methods. With its newly-developed laser diodes having a wavelength range of 1.3 µm to 2 µm, VERTILAS is one of the leading global providers in the fi eld of long-wavelength VCSELs. In contrast to conventional laser diode technology, VERTILAS’ newly developed laser diodes emit normal to the wafer surface, hence the name Vertical-Cavity Surface-Emitting Lasers. These VCSEL diodes stand out for their high-speed data transfer capabilities (up to 10 Gbit/s), as well as for their small structural shape, low current threshold and low power consumption. Long wavelength VCSELs constitute a core component of future laser-optical communication networks, through which fiber-to-the-home plans are being made possible for the first time in a cost-effective manner. In addition to meeting increasing demand in optical communications, VERTILAS’ long wavelength products which have already propelled the company to a leading position worldwide, offer numerous applications for use in gas sensor engineering and optical measuring methods. It is not only new experimental intellectual property that can be commercialised. After completing his PhD in the group of Peter Vogl, Stefan Birner set about marketing nextnano, a software package for simulating the physical and electronic properties of realistic semiconductor heterostructure quantum devices. The software is extremely versatile and is capable of calculating the electronic properties of arbitrary semiconductor nanostructures using the principles of quantum mechanics. Furthermore, the electrical current flowing through the structures can be calculated and the tool will soon be able to simulate optical properties. The nextnano project received a grant from the Federal Ministry of Education and Research EXIST-SEED program for University-based start-ups to improve its business plan. In 2012, Stefan Birner founded the nextnano GmbH. Dynamic Biosensors GmbH is a provider of instruments, consumables, and services in the field of analytical systems for the characterization of biomolecules and molecular interactions. They are located in Martinsried south of Munich, a vital center of Europe‘s biotechnology industry. Dynamic Biosensors commercializes the switchSENSE™ technology, a groundbreaking platform technology for the analysis of biomolecules with applications in R&D and drug development. switchSENSE has originated from a collaboration between the Walter Schottky Institute of the Technische Universität München in Germany and the Fujitsu Laboratories in Japan. It is protected worldwide and only available through Dynamic Biosensors GmbH. Brolis Semiconductors Ltd. is a high-tech company, headquartered in Vilnius, Lithuania. The company was established in 2011, by three Vizbaras brothers: Augustinas, Kristijonas and Dominykas who specialize in long-wavelength semiconductor lasers and molecular beam epitaxy. Both, Augustinas and Kristijonas were associates of the Semiconductor Technology Group at the Walter Schottky Institut. The manufacturing facility and the company headquarters were established in Vilnius, the capital city of Lithuania. The mission of Brolis is to become a world-leading provider of complex epitaxial structures based on arsenides and antimonides for the electronic and optoelectronic world market. Their strength is a combination of innovation, flexibility, hard work and world-leading expertise in the field of molecular beam epitaxy of antimonide and arsenide based materials for long-wavelength optoelectronics. As a result of their MBE expertise, they are proud to deliver world’s only room-temperature GaSb laser diodes in the wavelength range for 2 µm – 3.8 µm. A fairly good measure of the scientific output of any fundamental research institute is provided by the numbers of publications in the scientific literature and also by the impact that this published work has in the wider scientific community. Since opening in 1988 over 2800 publications have appeared with the affiliation Walter Schottky Institut (According to the Web of Science database – Dec 2017) , a remarkable figure that translates to 2 publications per month in the scientific literature over the past thirty years. These 2800 publications have been cited more than 73 000 times and count amongst them 110 papers in Physical Review Letters, 330 papers in Applied Physics Letters, 345 papers in Physical Review B, 40 in Nature Nanotechnolgy, Nature Materials, Nature Photonics or Nature Physics and 20 papers in Science or Nature. The scientific output of the Walter Schottky Institut has drawn increasing attention over the two decades since the institute was founded, with 5000 citations of work stemming from the WSI in 2017 alone. In addition to scientific publications, smart ideas and innovative technologies developed within the WSI have been patented. The total numbers of patents written by members of the Walter Schottky Institute translates to two per year since its foundation and many of the novel concepts and innovative technologies have progressed from the research laboratory into the commercial sector. Examples include the fundamental research on high electron mobility transistor (HEMT) that was performed in the 1980’s and 1990’s and is now exploited for amplifiers in mobile and satellite communications and the laser lift-off of light-emitting diodes used by OSRAM. The high quality of the scientific work being performed in the Walter Schottky Institut is reflected by the large number of scientific prizes that have been awarded to our students and staff alike. Over the past three decades more than thirty prizes for outstanding research have been awarded to our students at various international conferences in semiconductor physics. Several students in our institute have also received awards for the best PhD thesis in the Faculty of Physics of TUM and other awards such as the Chorafas Prize, the Edison Prize from General Electric and the Corbett Prize of the ICDS have been conferred on our students. Collectively, these prizes are testament to the very high level of skill and dedication of our research students and we are very proud of each and every one of them. In addition to numerous prizes for our students, more than 10 high ranking scientific prizes have been awarded to members of the institute including the most prestigious prize for young scientists working on fundamental research in condensed matter physics research in Germany, the Walter Schottky Prize from the Deutsche Physikalische Gesellschaft (DPG). Given the name of our institute, it seems fitting that this prize has been awarded to three members: Gerhard Abstreiter in 1986, Martin Stutzmann in 1988 and Jonathan Finley in 2007. Gerhard Abstreiter was also the recipient of a number of other high ranking scientific prizes including the Gottfried Wilhelm Leibniz Prize of the DFG in 1987, the Max Born Prize jointly awarded by the British of Institute of Physics and the DPG in 1998 and the most highly ranked prize from the Bavarian Academy of Sciences, the Friedrich Wilhelm Joseph von Schelling Prize in 2006, to mention only a few. Prof. Amann was awarded the Karl Heinz Beckurts Prize in 2004 in combination with one of our PhD graduates, Dr. Markus Ortsiefer. This prize is awarded by the Karl Heinz Beckurts Foundation for outstanding advances in fundamental research and, moreover, the commercialisation of novel ideas with the highest levels of technical innovation. Gregor Koblmüller was awarded the Arnold Sommerfeld prize of the Bavarian Academy of Sciences in 2016 and Kai Müller was elected in 2017 to be a member of the Junges Kolleg of the academy. Alex Holleitner and Gregor Koblmueller are both recipients of the prestigious ERC Starting and Consolidator Prizes of the European Research Council, the gold standard label of highly successful fundamental research. The high quality of the scientific members of staff in the Walter Schottky Institut is also reflected in offers to take up professor positions at other universities within Germany and, also, worldwide. To date, more than twenty five of the researchers in the WSI have received offers to take up positions as professors and institute directors at other universities. Whilst some of the offers are inevitably accepted and represent the natural career progression of a young scientist, we are very happy that also many of the scientists chose to remain at the WSI and further their careers in the excellent scientific environment that exists in the Munich area. University life is defined by having regular and active contact between professors, researchers and undergraduate students at all stages of their studies. All scientific members of the WSI are actively and willingly involved in teaching undergraduate and graduate students and provide a broad base of lecture courses with topics ranging from basic physics through intermediate courses in solid-state physics and quantum mechanics to advanced special lectures on semiconductor physics, opto-electronics, solid-state theory, nano-photonics, physics of low-dimensional systems, bio-physics, quantum computing, renewable energy and quantum optics. Graduate students also have very close contact to undergraduates via problem classes and practical experiments, often embedded within research laboratories in the WSI. Members of the WSI combine traditional teaching methods with new technologies to provide a vibrant and enriching learning experience for the students. All lecture courses at the TUM are independently assessed by the students association, the so-called Fachschaft. Lectures presented by members of staff in the WSI have been consistently rated by the students to be amongst the best they hear and our lecture courses have regularly been commended through the award of the Golden Chalk; a prize that is awarded by the students themselves each semester for the best lectures. Only four of these prizes are awarded each semester across the entire spectrum of lectures presented in the Physics Department. We are very proud that over ten of these awards were won by WSI professors and staff in the last decade. To place this figure into context, note that there are only eight awards per year across the whole of physics and 17.5% of all prizes have been awarded to WSI members over the past ten years, despite less than 10% of all lecture courses being offered by our institute. This proven excellence in teaching is something that all of us here at the WSI are very proud of.